Eh Wah was born in Burma. She came to Canada in June 2007. Her first 2 years were spent in Toronto, but when her husband got a job in Winnipeg, they moved here in 2009. Eh Wah says that, in the beginning, she learned English by listening. Her daughter Juslina was born in 2011 and she began to take part in some of the Mosaic family programs: "Nobody's Perfect" and "Wiggle Giggle Munch", which were a lot of fun and a good way to meet new people. When she took "Bounce Back and Thrive" and met Jean, she was introduced to the other side of Mosaic - the English Language Classes. Eh Wah started classes in 2013 and finds that her English is improving all the time, and she finds it easier to communicate with people. 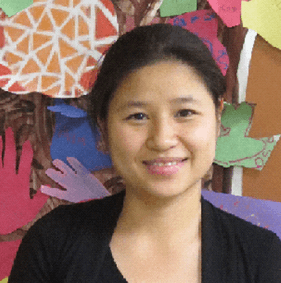 Eh Wah is now a volunteer in one of the family programs, Wiggle Giggle Munch at John M King School, and says that she finds Mosaic to be such an interesting place, full of friendly people, with staff from all over the world.